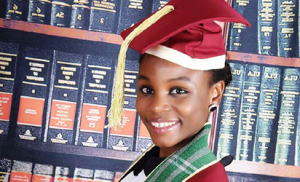 17 year old Miss Faizal Abu bakar Sani, a former student of Olumawu School, Abuja, has been awarded scholarship by the Kano State Government to study in any university of her choice in the world and to any level she wants following her exceptional performance at the 2016 West African Senior School Certificate Examination (WASSCE). It was learnt that she had A1 in English Language, Mathematics, Further Mathematics, Chemistry, Physics, Biology, Computer Studies, Civic Education and Marketing. The result has been adjudged as the best ever in the state by the Kano state government (Miss Faizal's state of origin). During interaction with newsmen, the young lady said she has already been offered admission to study Medicine in about 7 Universities in the United Kingdom and one other University in Egypt. When asked about her reading habit, Faizal who scored 226 in the last JAMB said said she does not have a specific study hour because most times she studies until she gets tired or fall asleep. On her part, Mrs. Hadiza Abubakar, Faizal’s mother, a lawyer, described her daughter as a quiet, reserved and responsible girl who has shown intelligence right from her birth.